SWANNY’S WORLD OF SPORT: It was me wot won it for Grant! Clearly chairman Darragh MacAnthony, despite aiming some barbs in my direction lately, has acted on my endorsement, printed on these pages two weeks ago. Posh legends, from left, Dave Farrell, Grant McCann, Mark Tyler. Photo: Joe Dent/theposh.com. As I said then McCann is no ordinary rookie. He’s played 577 professional games, he’s conducted himself with a lot of class throughout his career, he’s been working on his coaching badges for a decade and he knows how to win promotion from League One having done it twice as a player, once with Posh. Joking aside I have a good feeling about the chairman’s work this week. It’s great to see the club in the hands of people who clearly care about Posh running things. McCann, David Farrell and Mark Tyler have over 1,000 Posh appearances between them. They’ve spent over 30 years at London Road in various roles between them. You don’t stay that long or last that long without ability or a genuine affinity. 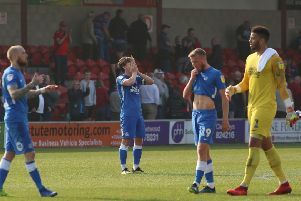 Obviously the proof will be in results, and his most important signing could well be an experienced first-team coach, but I sense something in McCann that you would never ever see in managers of the recent past or in many of those put forward since Graham Westley’s tortuous reign came to an end. I sense a softly-spoken character with a hard streak. He was the same as a player as this cultured midfield play-maker picked up seven red cards in his career. That toughness was shown even before he was officially appointed. McCann was part of the process in deciding Gaby Zakuani, a former team-mate and current friend, would not be offered a new contract. McCann’s first signing is Hayden White (right) who plays in the same position as the manager’s fellow Northern Ireland countryman, right-back Michael Smith. Pleasingly the overwhelming reaction (seen by me at least) to McCann’s appointment has been positive. Some point to his association with Robertson and Westley as negatives, while others believe he won’t be strong enough to stand up to his demanding chairman. I believe they are wrong on both counts. Does anyone seriously believe Westley took advice from anyone? The man was so self-assured he’d probably ignore offers of help from Sir Alex Ferguson. And don’t be fooled by McCann’s ‘quiet man’ persona. He didn’t shy away from confrontation when falling out with Darren Ferguson, a manager who could rage with the best of them. McCann left Posh then to play for Linfield, the team he supported as a boy when growing up in Belfast, but as soon as Ferguson left, back he came to the ABAX in a flash. He loved Linfield, but he loved Posh more. MacAnthony needs a successful manager to boost his own standing in the game. I reckon he has just appointed one.